Feel the burn when you step up on the ProForm® HIIT Trainer. 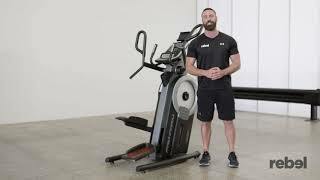 This revolutionary machine combines a smooth 10-inch vertical elliptical path with powerful, upper-body movements to simulate stepping while boxing, getting your body sweating and burning calories throughout your workout and beyond. 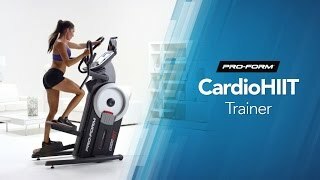 High Intensity Interval Training, or HIIT, is a training technique that involves repetitively giving 100% effort for a set amount of time followed by short recovery periods. You?ll get and keep your heart rate up, burning more calories and building strength throughout your workout. Forget noisy air resistance trainers. The HIIT Trainer brings you SMR™ Silent Magnetic Resistance. It?s quiet, smooth, and durable so you can focus on your workout?without disturbing your home. Use the built-in 7? backlit display to swipe through your speed, time, distance, calories burned, heart rate, and more. Large, easy-to-press buttons make it simple to change your resistance level in an instant. Control your workout effortlessly by managing your audio, fan, workout programs, and much more. We know when you?ve made up your mind about getting fit, you mean business. So we made sure your workout stats are right in front of you as you work out. And, add entertainment to your training by putting your own tablet into the attached tablet holder.